A lot of homeowners often look for ways to spruce up their bathrooms without going for a full renovation, especially when they’re on a limited budget. When it comes to giving your bathroom a distinct but quick facelift, there are a few easy life hacks that you should know about. In today’s blog post, we’ll give you some simple yet amazing ideas to update your bathroom vanity. If the vanity countertop is in good shape and you’re looking for a low-cost renovation, don’t replace it with a new countertop. Give your bathroom vanity a new appearance with fresh paint instead. When you hire a professional service for painting, the experts will first remove the drawers, hardware, and the cabinet doors and treat the surfaces to be painted with trisodium phosphate. For wooden vanities with a transparent finish, they’ll sand the surface to remove gloss, damaged paint, etc. and wipe the surfaces clean before applying paint. After the paint dries overnight, they’ll reassemble your vanity. You can freshen up the look of your generic bathroom vanity instantly by replacing the old hardware. Opt for stainless steel, nickel, or metallic handles and knobs for a sleek appearance. Hardware is often an overlooked area when it comes to upgrading the look and style of your bathroom space. Your bathroom vanity countertops withstand a lot of rough treatment including spills, splashes, soap scum, toothpaste stains and more. To give your vanity and your overall bathroom an instant makeover, replace your dated countertop. 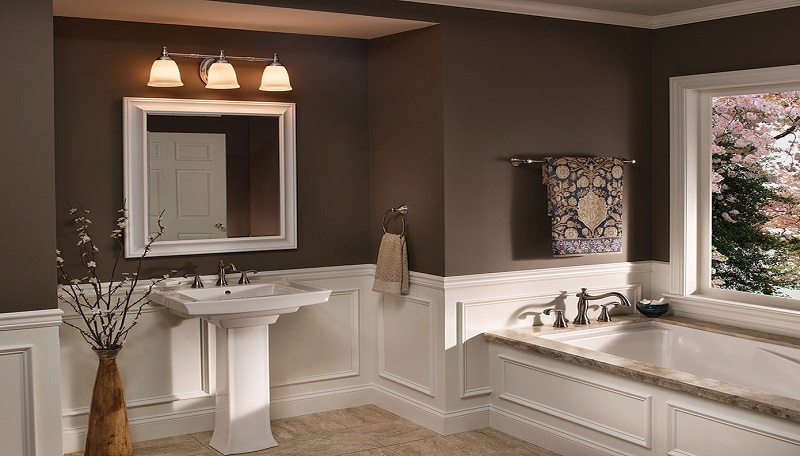 Vanity tops are available in a wide variety of materials, styles and functionality. Laminates and glass make good choices when you’re looking for low-maintenance options within a small budget. For high-end durability and style, quartz, marble and granite are excellent options. When choosing a vanity style, keep your usage needs in mind. For example, if multiple family members use the bathroom and there’s always a morning rush, a vanity top style with double sinks is a perfect solution. Also, choose the faucet fixtures that can be conveniently used by all the members of the family. One of the best ways to refresh your bathroom and dated vanity is by adding new cabinet doors and drawers. Maximize your vanity storage options by utilizing space under the sink. Invest in some mini roll-out, swing-out shelves or drawers and sliding trays to install in your vanity. These drawers and trays will help you keep your vanity clutter-free, bring items into easy reach, and update the look of your vanity. You can also replace old cabinet doors with flat-faced cabinets in the vanity to give it a more contemporary look. Follow these suggestions and see the difference they bring in to the appearance of your bathroom. However, selecting the right vanity style for your bathroom can be overwhelming. If you’re not sure about what will work best for your bathroom, contact a bathroom designer expert.